진도씻김굿은 죽은 이의 영혼이 이승에서 풀지 못한 원한을 풀고서 즐겁고 편안한 세계로 갈 수 있도록 기원하는 진도지역의 굿으로, 원한을 씻어준다해서 씻김굿이라 한다. 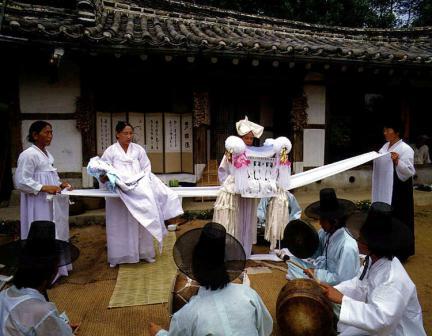 씻김굿은 불교적인 성격이 강하기 때문에 고려시대에 만들어진 것으로 보이며, 시간과 장소에 따라 굿의 내용이 다르다. 초상이 났을 때 시체 옆에서 직접하는 곽머리씻김굿과 죽은지 1년 되는 날 밤에 하는 '소상씻김굿', 죽은지 2년 되는 날 밤에 하는 '대상씻김굿', 집안에 병자가 있거나 좋지 않은 일들이 자주 일어날 때 벌이는 '날받이씻김굿', 임시로 무덤을 만든 후 묘를 만들 때(초분이장 때) 하는 씻김굿, 집안의 경사에 대해 조상의 은혜를 기리며 하는 '영화씻김굿', 물에 빠져 죽은 사람의 한을 풀어주는 '넋건지기굿', 총각이나 처녀로 죽은 사람들끼리 혼인을 시켜주는 '저승혼사굿' 등이 있다. 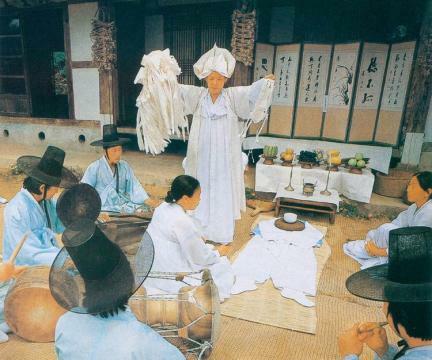 씻김굿의 순서는 조왕의 하강일(下降日)이거나 도회(都會)일 때 하는 조왕반과 조상께 굿하는 것을 알리는 안땅, 길에서 죽어 떠도는 혼을 불러들이는 '혼맞이', 죽은 사람의 혼을 불러들이는 '초가망석', 불러들인 영혼을 즐겁게 해주는 '처올리기', 천연두신인 마마신을 불러 대접하는 경우와 죽은 사람의 이승 친구들의 영혼을 불러 즐겁게 해주는 '손님굿', 불교적인 '제석굿', 원한을 상징하는 고를 풀어가며 영혼을 달래주는 '고풀이', 시신으로서의 영돈을 마는 '영돈놀이', 맑은 물로 깨끗이 씻어 즐겁고 편안한 세계로 가도록 기원하는 '이슬털기', 영돈 위의 넋을 끄집어내어 손에 들고 십왕풀이를 하는 '왕풀이', 이승에서 맺힌 원한을 모두 풀어주는 '넋풀이', 억울한 원한의 넋두리를 풀어주는 '동갑풀이', 약을 구하지 못해 죽은 한을 풀어주는 '약풀이', 죽은 사람의 한이 풀어졌는가를 보는 '넋올리기', 가족이나 친척들이 손대를 잡으면 죽은 사람의 혼이 내려와 원한을 말하는 '손대잡이', 저승의 육갑을 풀어주는 '희설', 좋은 세상으로 가는 길을 깨끗이 닦아주는 '길닦음', 죽은 사람의 혼을 공손히 보내는 '종촌'으로 되어 있다. 진도씻김굿의 음악은 육자배기목(시나위목)을 중심으로 피리와 대금, 해금, 장고, 징으로 구성된 삼현육각반주로 진행된다. 무당은 흰색 옷에 다홍색 띠를 걸치는 정도의 소박한 옷차림으로 불교적 성격이 짙은 승복과 비슷하며 죽은 사람의 한을 풀어주는 지전(紙錢)춤을 춘다. 노래는 홀로 부르는 통절(通節)형식과 선소리를 메기고 뒷소리로 받는 장절(章節)형식으로 되어 있으며, 선율의 부침새와 여러 가지 세련된 목구성을 구사해 매우 흥겹고 아름답다. 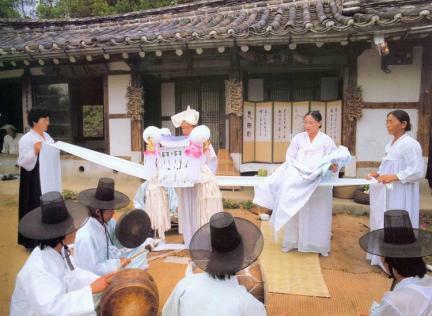 진도씻김굿은 죽은 사람 뿐 아니라 산 사람의 무사함을 기원하는 불교적 성격을 띠고 있는 굿으로 춤이나 음악에서 예술적 요소가 뛰어나고 자료가치가 또한 크다. 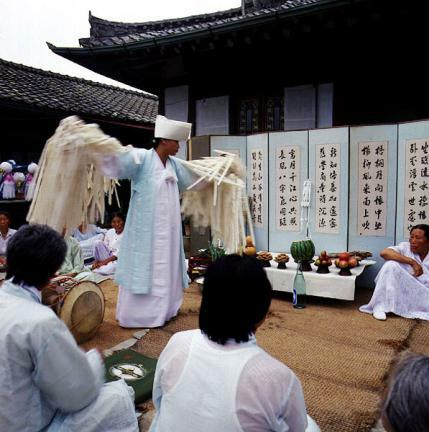 This is a ritual held to pray that the spirit of the dead may forget all grudges and go to heaven happily and that people still alive may live peacefully. 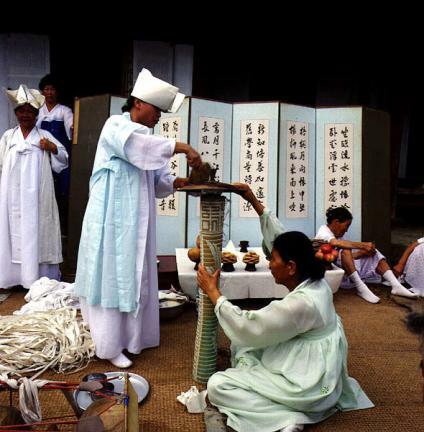 The word ssitgim comes from the Korean verb ssitgida (to wash someone). 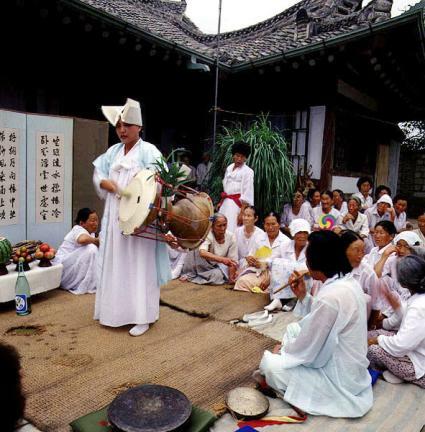 The ritual, which is deeply associated with Buddhist beliefs, is thought to have started in the Goryeo Period (877 – 1394). 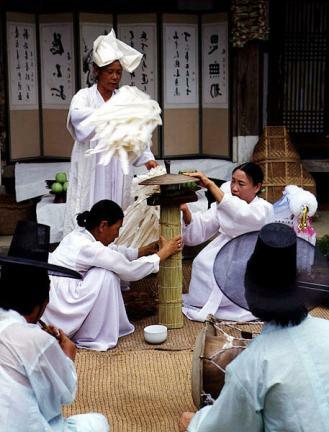 Details of the performance depend on what the occasion is, for example, right after a death, the first/second anniversaries of the death, or burying the body after letting it stay on the ground covered with grass or straw for three to ten years. 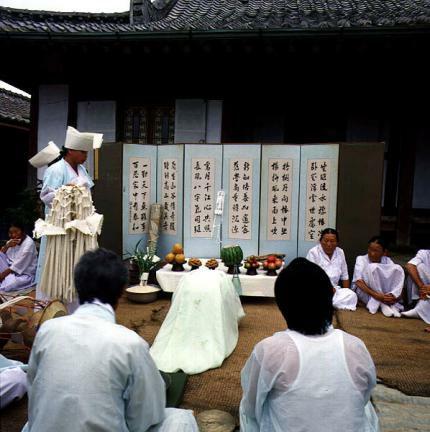 The ritual is carried out in the following order: Anttang (a sacrificial rite for deceased ancestors), Chogamangseok (invoking the spirit of the dead), Cheoolligi (entertaining the spirit), Sonnimgut (entertaining the spirits of friends of the dead), Jeseokgut (a rite for a deity handling matters such as people’s longevity, grains and clothes), Gopuri (consoling the spirit), Iseulteolgi (washing the spirit of the dead and praying that the spirit go to heaven peacefully), Yeonghwa Ssitgimgut (thanking for ancestors’ protection on a congratulatory occasion of the family), Neokgeonjigut (consoling the spirit of a drowned person), Jeoseung Honsagut (a rite for marriage between the spirits of a dead unmarried woman and man). 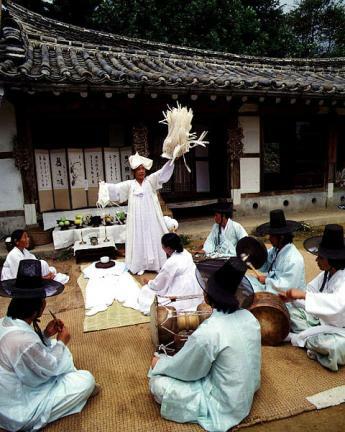 The ritual is performed to the accompaniment of music played on piri (flute), daegeum (large-sized bamboo flute), haegeum (two-stringed fiddle), janggo (hourglass-shaped drum), and jing (large gong). 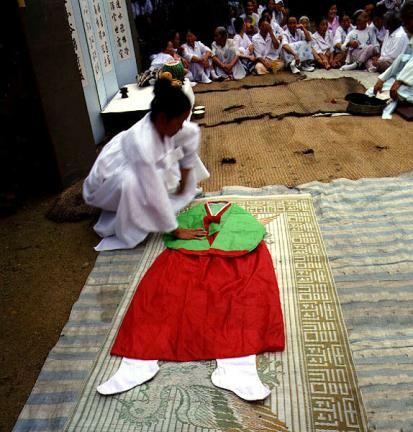 The robe worn by the exorcist looks similar to that of a monk. 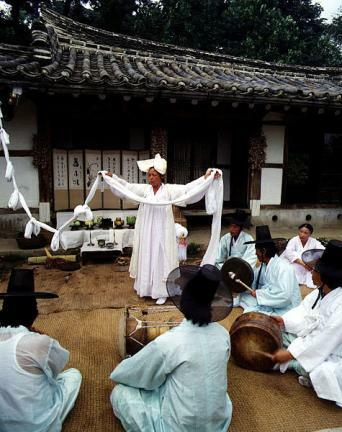 She dances and sings songs to help the dead forget all their grudges. 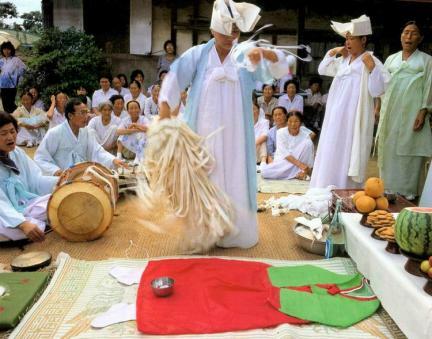 The dances and music used in the ritual displays high artistic quality. 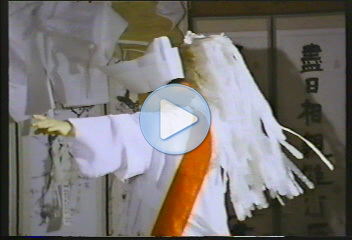 The rite is also a valuable source of material for those studying cultural heritage.